Toyota confirms European recall | What Car? Toyota is to recall UK-based cars that might be affected by a faulty accelerator pedal. The move follows a 3.39 million-car recall in North America. Toyota is still assessing how many European vehicles share the same parts involved in the US recall. In a statement issued today, Toyota said: 'There is a possibility that certain accelerator pedal mechanisms might, in rare instances, mechanically stick in a partially depressed position or return slowly to the idle position. 'The problem can arise when the pedal mechanisms become worn, which combined with certain operating and environmental conditions increases friction, making the accelerator pedal harder to depress, slow to return, or even stick partially open. Toyota insists that problems are rare, but worried customers are advised to contact Toyota's Customer Relations on 0800 138 8744. Sales of eight models have been suspended in the US, while Toyota fixes faulty accelerator pedals that could stick, causing unplanned acceleration. Last week's 2.3 million-car recall was extended today to include another 1.09 million vehicles over 'floor mat' problems. Did Toyota's focus on growth distract from quality? 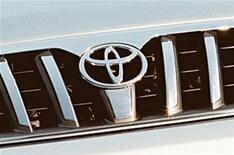 In 2002, Toyota bosses set a goal to grow by 50% and become the world's biggest car maker with 15% of the global car market. It reached that goal, but at the same time the company's reputation for quality and reliability has faltered.